If you are one of the 28 million Americans suffering from migraines, you know how hard it is to find relief. The Everything Health Guide to Migraines is your perfect resource for information about symptoms, coping methods, and both medicinal and natural treatment options for your migraines. This handbook provides clear, concise information to help you understand the problem and find a solution. This book will assist you in accurately diagnosing your condition and managing your physical and emotional health. It is your compass on the road to recovery and the future of your migraine care. 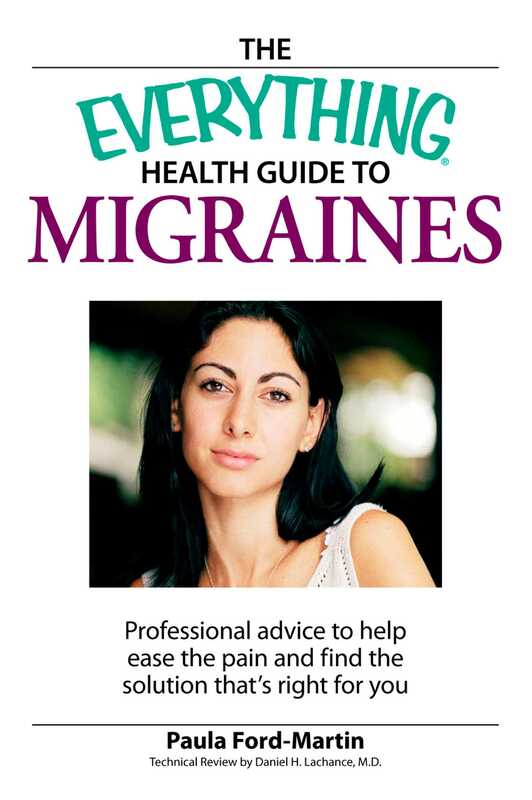 With The Everything Health Guide to Migraines, you can say goodbye to migraine pain! Paula Ford-Martin is a health writer with more than twelve years of experience who has suffered from migraines since childhood. She is the author of several Everything health guides. Paula has written extensively for traditional and alternative medicine publications. She lives in Connecticut. Daniel Lachance, M.D., is a neurologist with more than twenty years of experience. A graduate of the Dartmouth Medical School, Dr. Lachance is appointed in the Division of Regional Neurology at the Mayo Clinic. He runs his own practice in his hometown of Rochester, Minnesota.